Baccarat has always held an air of mystery for me, ever since I saw it being briefly played in a couple of James Bond movies. Visions of the casino floor, beautiful people standing around the table and James Bond in his tux just added to the romance of the game. While watching I had no clue what was going on, how the game was played or even how the winner was determined. Fast forward quite a few years and I’ve discovered that Baccarat is essentially a very simple game in it’s concept. No skill is required of the player in the game, just the ability to predict which will be the winning hand, Player or Banker. You wouldn’t think that something as simple as that could be made to look so complicated. But the art of predicting what hand will win has been turned into a science (not an exact one at that) and that is where Baccarat Roadmaps come into play. The roadmaps have been developed to help players quickly assess the history of the game, to identify trends and help to predict future results. The roadmaps look one of the most scariest tools around and it’s because of them that I stayed away from this game for as long as I did. It’s only when I’ve been doing some research into what they’re all about that the mystery has been turned into something I can understand. It’s taken me a while to find an understandable description of Baccarat Roadmaps and how they are constructed, but find one I have. I have to thank BetConstruct and VBET Casino for allowing me to use their descriptions. I’ve simplified them as much as possible to make it easy to digest and understand. Hopefully you’ll be able to use this information to increase your enjoyment of playing live baccarat. Watch my Baccarat Betting Strategy Video or read my explanations of how I use the information in Roadmaps to tell me when & where to place my bets. So what are Baccarat Road Maps? Baccarat trends are recorded on “Roads”, which are pictorial representations of the results and trends of the shoe as hands have been dealt. The roads help players to quickly assess the history of the game, identify trends and attempt to predict future results. The roadmaps record the history and trends of the current dealing shoe. Players can use this information to help them determine how to bet. There are no recommended ways to apply this information to make future betting predictions, each player is responsible for using the information for how they see fit. A new set of roadmaps are created when a new dealing shoe is put into play. Two of the roads, The Big Road and The Bead Plate are the only two roads that record the actual results of the shoe. The Big Eye Boy, The Small Road and Cockroach Road are all derived / created from the Big Road and record the trends of the shoe. The grids for displaying the roadmaps are always 6 rows high and a minimum of 12 columns wide. The colours and symbols used do not have a consistent meaning across the all roadmaps. Be sure to check each roadmap for their meaning. 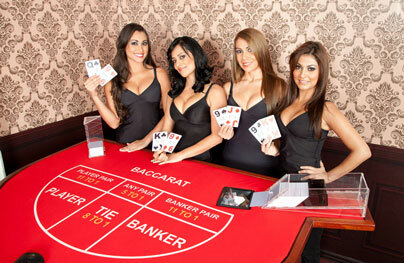 At first, Baccarat results were just recorded on the “Big road”. This is the main road and it is the road that all other roads are derived from. The Big Road is fairly simple. It is a grid, always six rows deep by many columns wide. When recording the Big Road, a hollow red circle represents a Banker win, and a hollow blue circle represents a Player win. When the shoe begins, the first result (Banker or Player, ignore ties for now) is written in the top left corner of the Big Road. If the second result is the same side as the first, it goes under the first, and as long as the winning side (Banker or Player) remains the same, circles of the same colour continue down vertically. When the “other side” comes up, a new column is started, and the process continues through the entire shoe in this fashion. As a result, the Big Road becomes a series of columns of alternating blue and red hollow circles, with a minimum height of one circle, and no maximum height. On the Big Road, Ties are not displayed as a separate circle, but simply as a green line across the most recent circle drawn. Multiple ties are shown with a small number next to the green line with that number representing the number of ties. 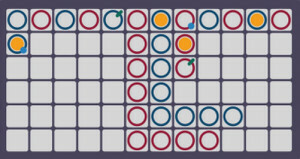 Pairs are displayed with a dot on the edge of the circle (red dot for Banker pair, blue dot for Player pair. Natural winners are displayed with a yellow dot in the middle of the circle. PING PONG is an expression which describes having a run of alternating Banker and Player wins. 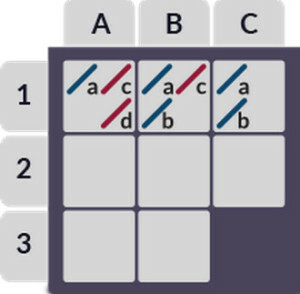 Some players refer to a run of two Bankers alternating with two Players as “double ping pong”. If there are more than six consecutive Banker or Player wins and the display runs out of room vertically the streak simply turns right when it hits the bottom of the grid and continues along the bottom row. Once the streak has turned right, it creates a pattern known as “The Dragon Tail”. Most Baccarat players agree that if a dragon appears, you should bet on it, hence the catchphrase, “follow the dragon”. Of course the longer any dragon, the better it is. If a streak happens to bump into a dragon along the bottom of the big road, it immediately turns right (no matter which row it is in), and creates a new dragon. Some players refer to this situation as a “Double Dragon”. The Bead Plate is an exact representation of every hand. Red means banker, blue means player and green means tie. 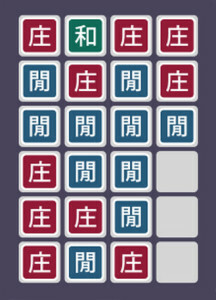 The symbols used are solid coloured circles superimposed with a Chinese character representing the result. The first symbol appears in the top left corner of the grid, the road fills down vertically through all six cells of the column, before moving to the second column, and those six cells are filled in, and so on. There is no moving to a new column until the previous column is filled, irrespective of the result of each hand. 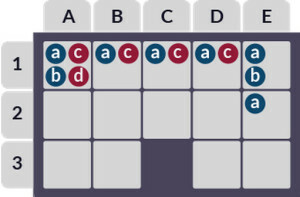 The Bead Plate does not show naturals or pairs, but unlike the Big Road it does show ties as a separate symbol occupying a cell in the grid. In 1970 the “Big Eye Boy” the Small Road” and the “Cockroach Pig” were invented in Macau. Collectively, these three roads are called the “derived roads”. Some people also refer to them as “predictive roads”. They are not a direct representation of the results of the shoe so far. They are all derived from the big road and describe the patterns in the Big Road. Each of Big Eye Boy, the Small Road and the Cockroach Pig describe slightly different kinds of patterns. Derived roads don’t tell you exactly what happened, they tell you whether there were patterns in what happened. 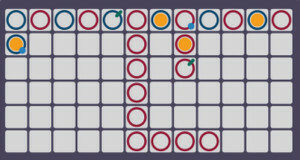 The derived roads are made up of red and blue symbols: hollow circles for Big Eye Boy, solid circles for the Small Road, and slashes for the Cockroach Road. IMPORTANT: The red and blue symbols that make up the derived roads do not correspond to Banker or Player. “Blue” generally means that the shoe is “choppy” with no pattern. For Big Eye Boy: The hand after the first hand in the second column of the Big Road. For the Small Road: The hand after the first hand in the third column of the Big Road. For the Cockroach Pig: The hand after the first hand in the fourth column of the Big Road. Once a derived road starts, an additional red or blue symbol will be added to that derived road after every hand. Using this Big Road as an example we can explain how the other roads are compiled. 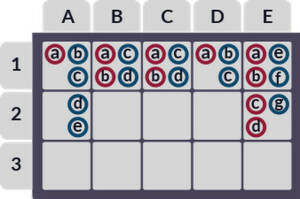 The Starting point corresponds to cell B2 on the Big Road scorecard, which is the second result (hand) after the first change in the game. If B2 is empty, the starting point is C1. For example, the first entry shows cell A1 on the Big Eye Boy table. This corresponds to the same hand represented in cell C1 of the Big Road table. Since cell C1 is the beginning of a new column, we check if the previous two columns are equal in length. If they are we colour the Big Eye Boy red for cell A1. If the columns are different in length, it would be blue. Next entry to see is C2 on the Big Road. On the Big Eye Road it corresponds to B1 so it’s blue because B1 and B2 don’t match. As the column C is finished, we should pass to D1. The table explains all next entries in the Big Eye Road. The next table is the “Small Road”. The Small Road works exactly like the Big Eye Boy, except it skips the column to the left of the current column in the Big Road. To have enough information to go on, the Small Road must wait until the entry in the fourth column of the Big Road. The starting point corresponds to cell E2 on the Big Road scorecard, which is the second result (hand) after the third change in the game. The next table is “Cockroach Road.” The Cockroach works exactly like the Small Road, except it skips two columns to the left of the current column in the Big Road. To have enough information to go on, the Cockroach Road must wait until the entry in the fifth column of the Big Road. So how do you use Baccarat Roadmaps to make your bets? This is the eternal question and you’ll get a thousand different answers depending on how the individual interprets the roadmaps. Players of baccarat are traditionally a superstitious lot so patterns that are displayed can influence a player to make a bet either bet to continue the pattern or to bet that the pattern will change.! If there was we would all be very rich!